This morning I took my girl to the eye doctor and after that, we decided to hit a few thrift stores. Right now I'm feeling a little pressure with everything I have going on and I should have been at home working on projects. I've been feeling like I'm spread a little thin right now with my booths at Monticello and Stars & Splendid, not to mention the Fall Premier Sale booth at Monticello Isabel and I are sharing and the Coburg Antique Fair coming up next weekend. Oh, did I mention, I'm trying to get the kids ready for going back to school next week too. Now, I don't want to sound like I'm complaining because I know that lots of you out there have very full plates right now too. My biggest dilemma is I don't feel like I have enough stuff to make a good showing at all the places I'm selling at. That's right, you heard me. Not enough stuff. Another dilemma I have is do I stay at home and work on what I have, or do I go out and try to find stuff that is ready to go? The second one is more fun, but you never know what, if anything, you might find. I'm so glad I chose that one today because this is what I came home with. I love the little mini dresser on wheels. It only needed a little sanding and tightening the glass knobs that it already had on it! Yeah! I love finds like this. The little four drawer dresser on top had "Bozo the Clown" decals on every drawer. If you are old like me, you probably remember Bozo. The decals while kind of cool and definitely vintage, were a little creepy. I just sanded them off, gave the knobs a little spray paint and it was also good to go. The mirrored medicine cabinet just needed a little cleaning. I love the long skinny mirror and the barkcloth has beautiful fallish colors. On top of the little dresser is a glass and metal display thingy. I think you are suppose to put candles in it, but I think you could use it as a little display cabinet and put some of your favorite goodies inside. This table was a curbside find. It didn't look like this though. The top was painted white and it had lots of colorful pictures painted on it by a child. Not real cute. I attacked it with some chemical stripper and I love this distressed look. It would be really easy to paint it, but I'm going to leave it as is. Tomorrow I will be heading back to Monticello for the Fall Premier Sale you have heard me and many others go on and on about. From what I saw on Tuesday, you will definitely not want to miss this one if you are in the area. Lots and lots of great finds the dealers have saved just for this show. I'll be wearing one of my new vintage dresses. (It's pink and white check so if you see me in it, stop me and say hi). Hope you come out for a fun shopping time! Wish I did live close, so like fun. I also wish i can go to that fair, it sounds so interesting and i like going to bazzaars. 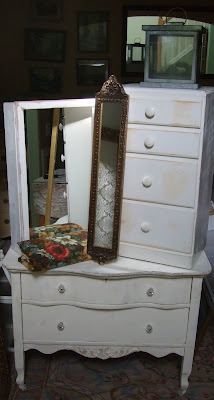 the dresser looks really cute, i wish i can have it in my bedroom. Thrifting days like you had today are so much fun!! I will try to get to Monticello tomorrow as I would enjoy meeting you. Good luck with the sale. I'm hoping to run into you at Monticello tomorrow - don't know when I'll show...depends on morning estate sales. Enjoy the sale, i too wish i lived closer so I could join you!!! Boy, do I ever know what you are talking about!!! My husband just rolls his eyes when I say I don't have enough stuff...and what should I do next...and trying to decide what goes where and what to save for my sale...it's the hardest part of the business for me. I just always choose to deal with the certains and *ignore* the uncertains:) It'll all come together...it always does! Have a good (productive) (but fun) weekend! You'll have plenty to go around and it will be gorgeous!! Great finds, Lisa. I'm glad you scored well and can be more relaxed about all of your shows. I just wish I could see you and your fab stuff in person! Just got back into town (a day late!) so didn't make it to Monticello .... YET! Hugs and have a great weekend .... maybe see you at Coburg. Boy, as a newbie to selling, I can relate to the not enough stuff part, and as a mom of 3 juggling alot, to how busy you are! 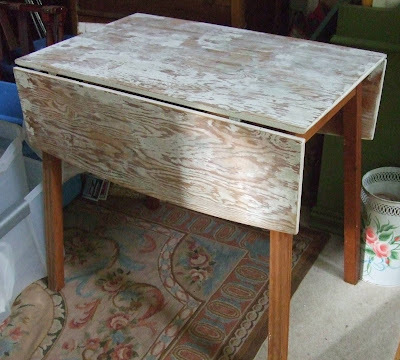 I still have those beautiful nightstands I got from you at Farm Chicks...wish I could head south this weekend for more! hi and i hope that the sale went great. my kids returned to school last week and my head is spinning with things to do, papers to look over, making sure laundry is kept up, what should my next blog post be! LOL somehow it all gets done. right? i totally remember bozo! too funny. great re-dos. yeah, I don't know how yo do it lisa!! But you are great at it! Lisa, you really do find the most amazing treasures.. That dresser is so pretty.. I also just love the lttle chest of drawers..